Unfortunately this one has no caption. 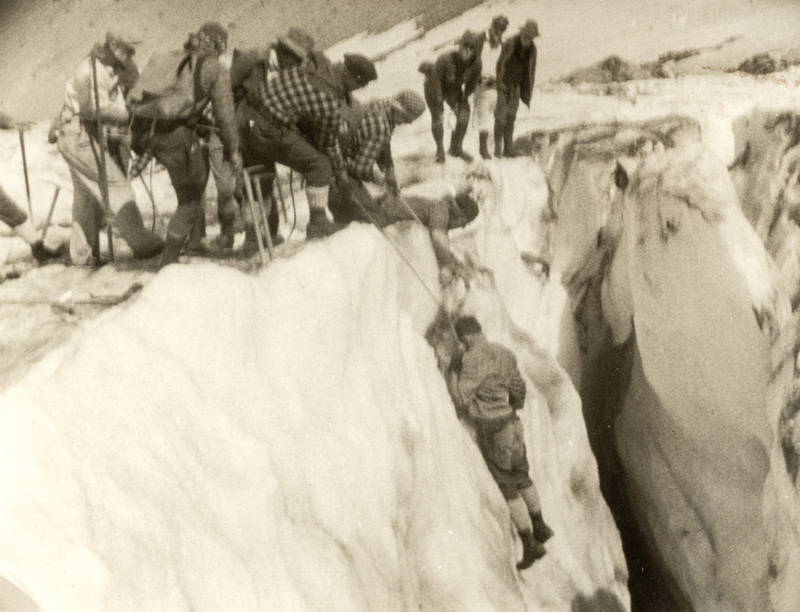 We know the Crag Rats are the country's oldest mountain rescue team, and here they are in action in the very early days. I can't tell if this is a training exercise or a real rescue. I'm guessing training by the number of people on site, but maybe someone else can fill in the story. I agree that this would have not been a recent photo and also feel that it is a training event. I naturally have never been on either a rescue or training session, but really don't think this day in age they would have simply pulled the man up out of there like this. Bill is the one that needs to get into the conversation here. If that is training, the victim sure has a lot of confidence in his comrades. Those three people to the right may be the next practice victims. If I was a practice victim, I would want to be dressed a little better for being drug up the side of an ice cliff. Couldn't help but notice the large patch on the "victim's" pants. My mother sewed a piece of Dad's old rain jacket on my climbing pants to increase the glissading speed as we slid down the Cooper Spur route after a successful climb of Mt. Hood.